After the governor, colonial secretary Alexander Macleay was the most important public official in the colony of NSW, with a salary and aspirations to match. In 1835 he started to build the ultimate trophy house on a magnificent waterfront site near the fashionable suburb of Woolloomooloo Hill, now Potts Point. Macleay’s property covered an expansive 54 acres (22ha) of prime harbourside real estate, and took in spectacular views east up the harbour towards the heads. It was in fact the textbook picturesque location, surrounded by rugged sandstone outcrops and cliffs, rich vegetation and bustling activity on the water – all desirable features for a gentleman keen to show off his position and taste. Macleay engaged the most fashionable architect in Sydney at the time, John Verge, who had already designed a number of handsome villas for other wealthy colonists. Before arriving in Australia in 1828, Verge had been a successful builder in London and was able to build to a style and standard not seen before in Sydney – and indeed, in the few years he spent here, he built several houses that are still regarded as the pinnacle of colonial era design.1​ To Macleay’s instructions, Verge produced a design for a splendid ‘marine villa’ in the Greek revival style, which was then at the peak of popularity. The models Verge drew on for the houses he designed and built in Sydney, including Macleay’s house, were the freestanding villas built around Regents Park in London in the 1820s,2​ their so-called Greek revival style inspired by the discovery and study of important archaeological sites in Italy, Greece and Turkey. ‘The Antiquities of Athens’, a series of exquisite drawings of ancient buildings by James Stuart and Nicholas Revett, was particularly influential. The early years of the 19th century also saw the creation of the modern Greek state (1828), while Greek culture was widely recognised as the foundation of Western thought in art, architecture, philosophy and politics – influences that were felt throughout the English-speaking world, including in NSW during the prosperous 1820s and 1830s. Verge may also have been influenced by architects such as Robert Taylor, whose compact houses for gentlemen of means have similarities to the plans used by Verge in his Sydney projects. It may be that Alexander Macleay approached Verge with a particular house plan already in mind, as the plan of Elizabeth Bay House is more complex but less resolved than some of Verge’s other houses. I am sorry to see him building so large a house … £6000 will be the cost of it at least … The elevation is very handsome, indeed it will be the finest house in the colony, but I do not see where the revenues are to come from to allow the occupants to reside in it with becoming dignity. Now surrounded by apartment buildings in the middle of one of the most densely populated suburbs in Australia, Macleay’s house was originally designed as the centrepiece of an extensive landscaped garden that cascaded down the slopes to the waterfront. Macleay started work on the garden before the house was even built and it quickly became famous for the way he planted and displayed his botanical collections among the native trees and rocky outcrops, which he had carefully kept. Macleay would have been familiar with the ideas of picturesque design that were widely followed inearly 19th-century gardens. His site at Elizabeth Bay provided the perfect opportunity to demonstrate those ideas and, like his fine house with its splendid interiors and furnishings, show evidence of his gentlemanly taste and refinement. He was also an enthusiastic amateur botanist and naturalist, building up a large collection of specimens that were housed in his library, the biggest room in the house. As we now know from his family papers and other sources, Alexander Macleay was financially over-extended several times during his life. It is likely that one of the main reasons he took the position of colonial secretary with its dependable salary was so he could retire debts from his over-ambitious lifestyle in England, where previously he had built himself a fine country house and nearly gone broke in the process. But arriving in NSW, Macleay quickly put other colonists and officials offside by making a land grant to himself at Elizabeth Bay, a decision supported by Governor Ralph Darling but which became a source of annoyance to him. Nor did Macleay enjoy good relations with the next governor, Richard Bourke, who eventually orchestrated Macleay’s ‘retirement’ from his post in 1837, aged 70 years. The loss of his salary just as he moved into his grand new house made Macleay financially vulnerable, especially as he was also involved in land speculation in other parts of NSW, often controversially. With the widespread rural recession in the 1840s, Macleay, like many over-ambitious landowners, found himself forced to sell his grand house to survive. In 1844 Alexander’s eldest son, William Sharp Macleay eventually stepped in to save his father from bankruptcy, taking over his extensive debts but forcing him in the process to leave Elizabeth Bay House. William had arrived in Sydney in 1839, aged 47 years, having taken early retirement after a short civil service career, and took up residence with his parents and sisters at Elizabeth Bay House. Active in the Linnean Society like his father, William was a distinguished naturalist with a distinctly scientific nature. He cultivated a circle of friends in the scientific world both in Sydney and abroad, and continued developing his father’s specimen collections. With Alexander Macleay’s departure, important furniture and contents, including his library of 4000 books, were sold to raise cash. 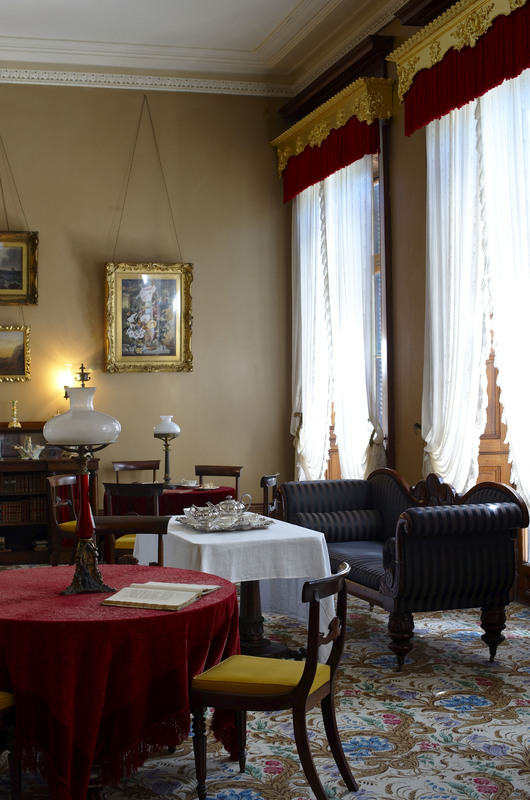 The detailed records of the sale, still available, have been used to recreate the interiors and furnish the house, and we have traced some of the main pieces of furniture to Government House, where they are still in use in the State Rooms. The splendid carved and gilded wood cornices at Government House also came from Elizabeth Bay House, and copies made from them have now been reinstalled in the drawing room back at Elizabeth Bay. 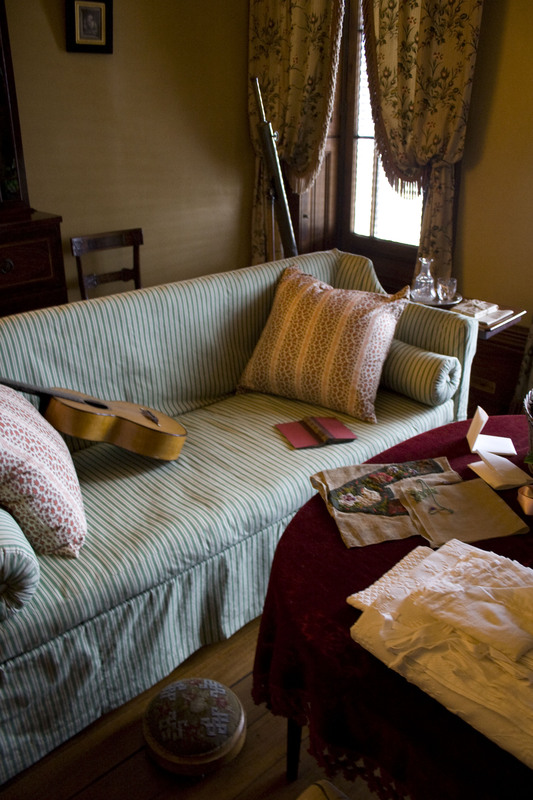 After his father’s death in 1848, William moved his mother and sister to their rural property at Camden and he lived on alone in the big house until 1865. For the remainder of the 19th century and well into the 20th, Elizabeth Bay House had a chequered history. With the property subdivided, the gardens were reduced to a small fragment and the house became home to a succession of tenants and served as a reception centre. The construction of Billyard and Onslow avenues divided the remaining garden, which was gradually built over. By the 1950s the grand rooms of the house had been subdivided into flats – and Potts Point had evolved from a suburb of genteel villas and expansive gardens into one of low-rent flats, with a slightly unsavoury reputation as an enclave of artists and bohemians, including for a time the well-known artist Donald Friend. An artist studio and flat in Elizabeth Bay House. Unknown photographer, c1950. Elizabeth Bay House was one of the first buildings in Australia to be recognised for its heritage value. As long ago as the 1950s, its state of damage and disrepair spurred the conservation movement. In the 1960s, following the loss of other colonial houses, such as Subiaco in Rydalmere and St Malo in Hunters Hill, campaigns to save historic buildings from demolition built up momentum. 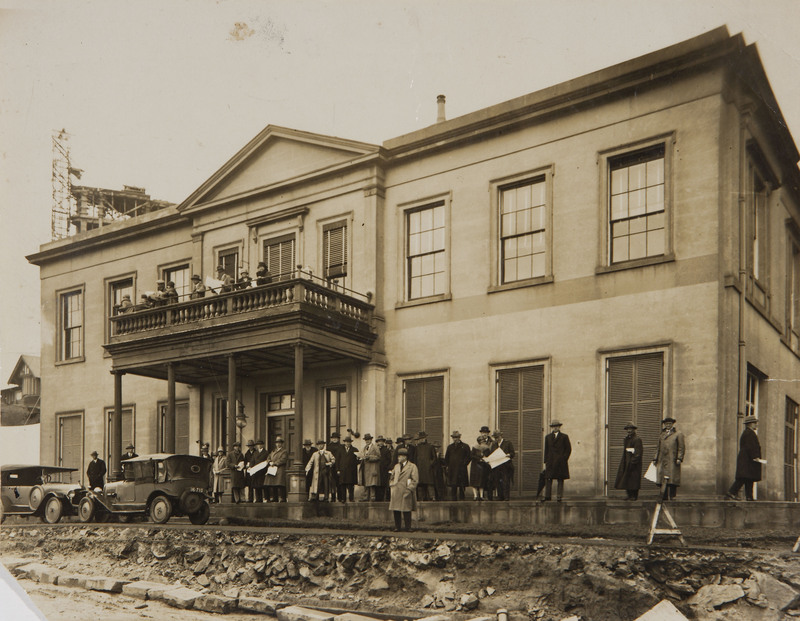 In 1961 the National Trust, a community-led organisation, started a process of listing and publicising important historic places, and Elizabeth Bay House was one of the first 50 places named. Around this time, the photographer Max Dupain made a series of exquisite photographs of the house recording its faded grandeur, and these have become iconic in their own right. 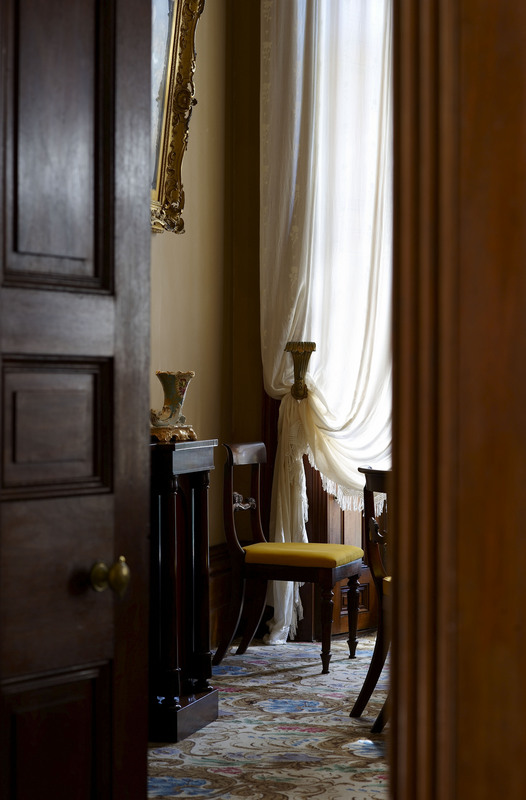 But it was still another 16 years until the house was extensively restored and refurbished, initially so it could become the official residence of the lord mayor of Sydney, and later when it became one of the first properties we acquired as the newly established Historic Houses Trust. 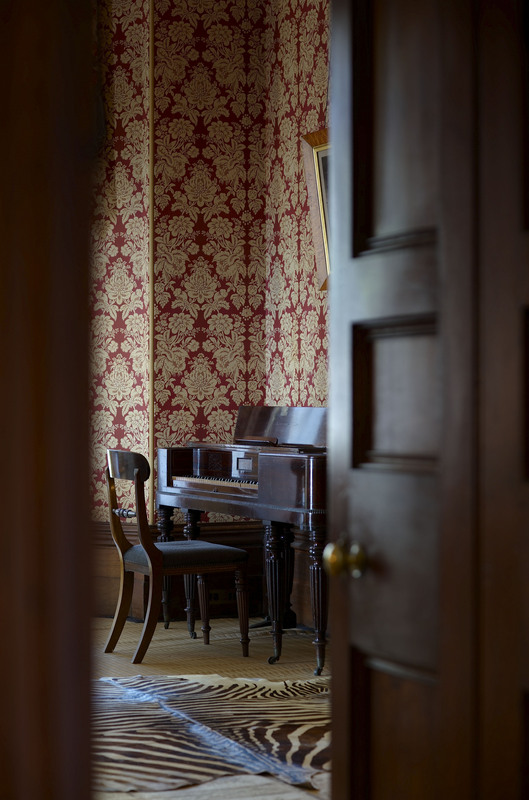 Today as you stand in Macleay’s entrance hall with its fine cedar doorways, the walls painted to resemble coloured marble, you may catch a glance into the comfortably furnished drawing room or the stately dining room and become aware of a more gracious past seldom experienced in modern Australia. 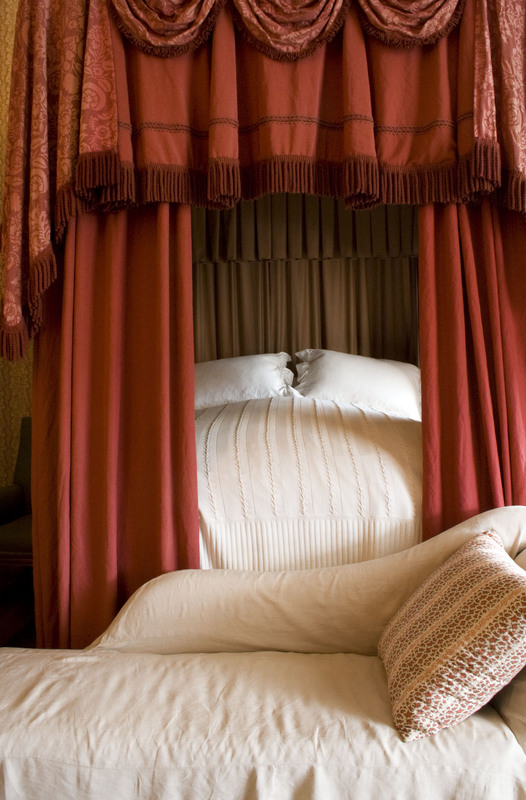 Passing through the Greek revival doorway ahead reveals a truly astonishing space – the three-storey high elliptical saloon and staircase leading to the spacious bedrooms above. Through a discreet door to your right is Macleay’s library and study, the largest room in the house and the centre of his other life as a botanist and natural historian; a room which speaks so eloquently of the interests and aspirations of a colonial gentleman. Macleay’s role as colonial secretary is now little more than a minor footnote in history but his house is an outstanding legacy. His story, that of ambition over-reached and personal financial loss, is a great Sydney story – a story which resonates as strongly in our own time as it did in the early 19th century. 1. Other examples include Rockwall and Tusculum, Camden Park, Engehurst, Goderich Lodge, Toxteth. 2. 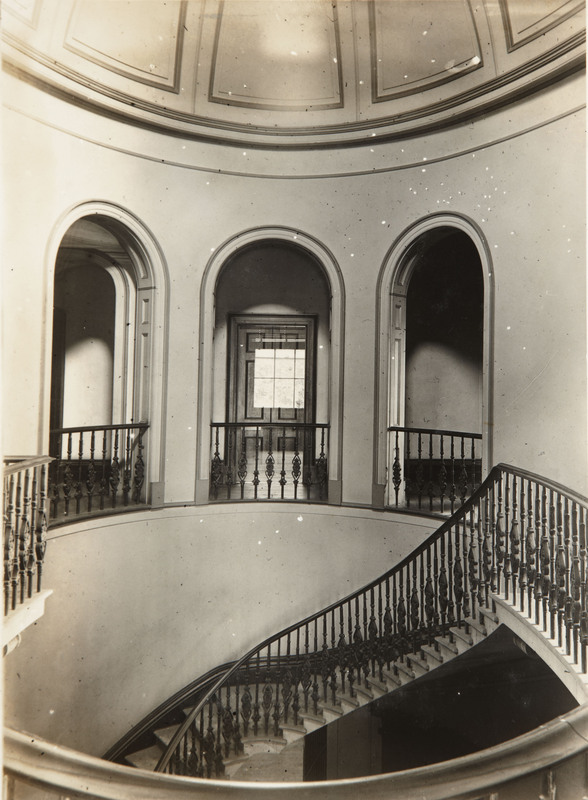 For example, designed by the fashionable architects John Nash and Decimus Burton. 3. W S Macleay papers, Mitchell Library A4303, pp17–18. 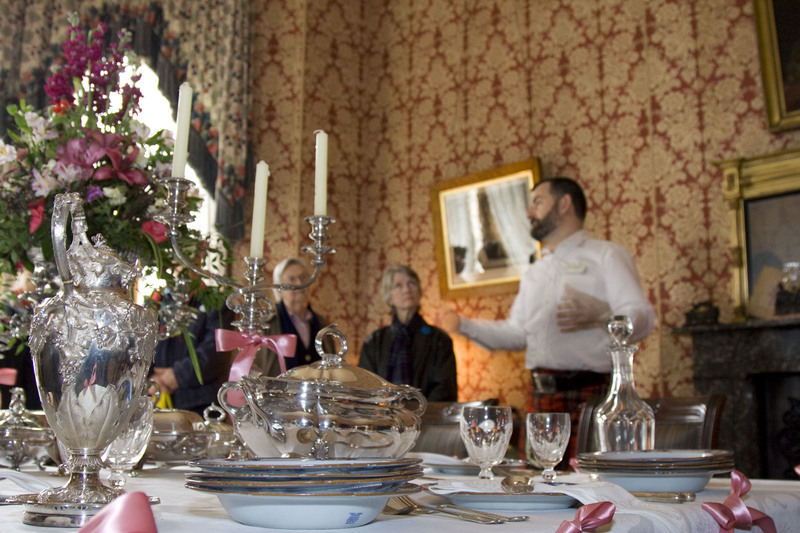 Curator Scott Hill addresses a group of museum visitors in the breakfast room at Elizabeth Bay House. 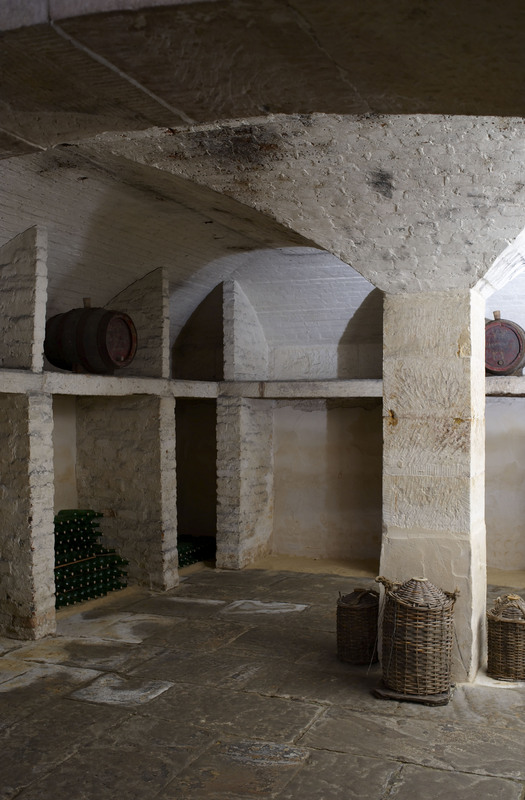 Vaulted ceiling and shelves in underground wine cellar, Elizabeth Bay House. Drawing room, Elizabeth Bay House. Bed and sofa, main bedroom, Elizabeth Bay House. Elizabeth Bay House open inspection and auction. Upper floor balcony and staircase, Elizabeth Bay House. Having worked on the conservation and sustainable management of historic gardens and parks in the UK, Europe and Australia – including long stints at Sydney's Royal Botanic Gardens and Centennial Parklands – Ian has now taken on the challenge of helping chart the future direction of Sydney Living Museums at a pivotal moment in its history. Artists, intellectuals, writers, radicals, revellers and misfits made Sydney's King's Cross home from the early years of the 20th century well into the 1970s. Following an extensive hunt, almost 300 volumes from the long dispersed Macleay family library have been returned to the bookshelves at Elizabeth Bay House. In 1835 colonial secretary Alexander Macleay set about building the ultimate trophy house, a shimmering, classical styled jewel box, perched in rugged bushland on the northern side of present day Potts Point, high above Elizabeth Bay with majestic views across Sydney harbour and beyond.